At 5:50 a.m. EDT (0950 UTC) on Sept. 11, from the Moderate Resolution Imaging Spectroradiometer or MODIS instrument aboard NASA's Aqua satellite revealed a small area of strongest storms in Paul. Those storms, pushed west of the center of circulation, had cloud tops with temperatures near minus 70 degrees Fahrenheit (minus 56.6 degrees Celsius). NASA research has found that cloud top temperatures that cold have the capability to generate heavy rainfall. 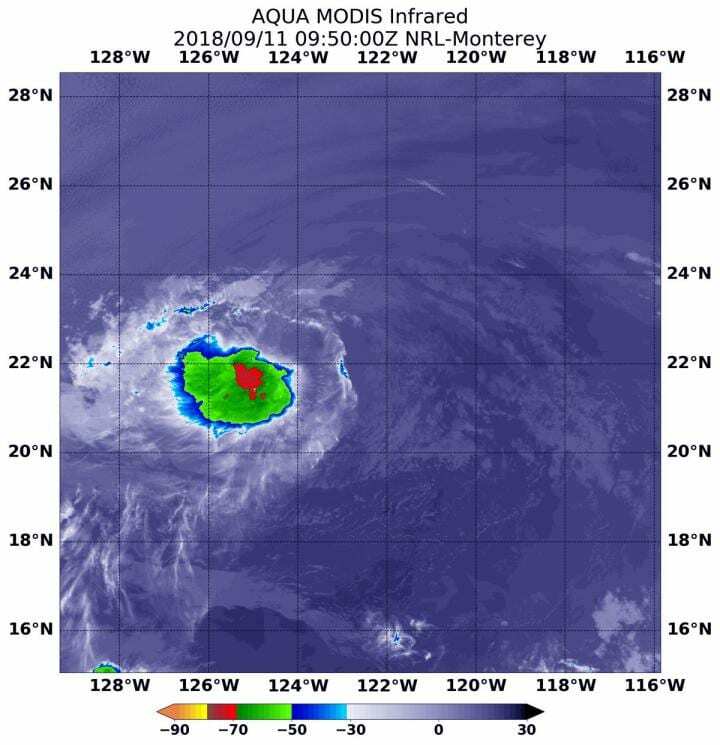 NOAA's National Hurricane Center (NHC) said "The center of Paul remains to the east of a small area of deep convection." At 8 a.m. EDT (1500 UTC), the center of Tropical Depression Paul was located near latitude 22.3 North, longitude 124.1 West. Paul is far from land areas so there are no warnings or watches in effect. It is centered about 905 miles (1,460 km) west of the southern tip of Baja California, Mexico. The depression is moving toward the west-northwest near 12 mph (19 kph). A gradual turn toward the west and a decrease in forward speed is anticipated over the next few days. Maximum sustained winds remain near 35 mph (55 kph) with higher gusts. Slow weakening is anticipated as Paul moves into a stable, drier air mass and over cooler sea surface temperatures. Paul is expected to weaken into a remnant low on Wednesday, Sept. 12.